Friday evening, join other zombie enthusiasts for the Sacramento Zombie Train. This is a “flash mob,” which is apparently a thing, that aims to get a large number of zombies aboard the last RT train to Folsom. 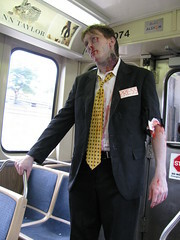 I didn’t realize there was anything but zombies on LRT after hours! If you want to join up, put on your best zombie costume and board the train that starts at Sac Valley Station at 6:28p. Other notable stops are posted after the break. This is the last train so you’ll need to figure out a way to get back. You’ll have plenty of delicious brains to eat if you decide to walk it. Next Next post: What’s worse (Halloween edition)?